Canal Street at Broadway, Manhattan, 1984. Late-night hangouts are one of the prime attractions of New York City. If you find one, you tend to keep going back because they tend to draw the same kind of crowd over and over. You don't get many tourist buses pulling at 4:15 a.m. One of the best was Dave's Corner Luncheonette at the southeast corner of Broadway and Canal Street. I decided to do this comparison of the above 1984 photo with its appearance in 2018. The recent shot below is from Google Street View. One can see from the photos, the buildings, street lamp, and pretty much everything else are unchanged despite the passage of over three decades. The building on the corner has been prettied-up a bit, and Dave's has been replaced with an Asian restaurant. The buildings in the background are the same, and the entire area looks pretty similar. 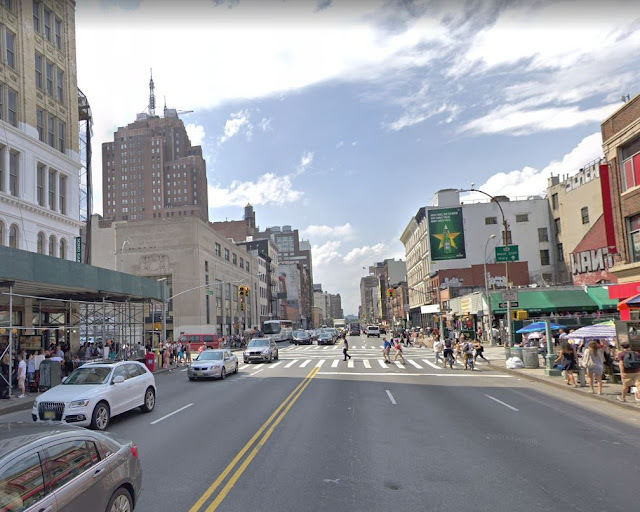 Dave's had one of the best locations in the city for a diner since it sat at the crossroads of Chinatown, SoHo, the East Village, and you could hop on the subway uptown and stop at Dave's on the way home to Brooklyn via the convenient subway stop right outside. on Canal. The same corner at night. This is how a lot of patrons will remember it best. Dave’s Corner Luncheonette was just outside the SoHo Broadway district. While there are plenty of great restaurants, they aren't all open 24 hours. While there are a lot of empty streets at that hour, places like Dave's are always busy. Patrons at the nearby Mudd Club would stop by for fries, while truck drivers would get a late dinner or early breakfast before heading back out of town. Everyone loved the three horseshoe-shaped lunch counters where little groups would congregate and get some espresso to keep on going through the night. "You Ring/We Bring" said the sign at the cash register. A lot of deals went down at Dave's in the middle of the night, as the clientele respected the entire spectrum of the area, which in those days was more blue-collar and artistic, but also included its share of young white-collar office dwellers. Cabbies would stop by during their shift for some quick coffee. Dave's had great egg creams, cherry cokes, cherry-lime rickeys, and other NYC specialties. One of the assets of Dave's was the older waiters and waitresses. It was like having your mom bringing your coffee and indicating her opinion of your personal sugar-and-cream preferences with a toss of her head. Sure, you could go somewhere else and have an indifferent college student bring you your order, but it was considered a sign of class to have the older servers. And, Dave's had class. It closed around 1990 and is sorely missed. 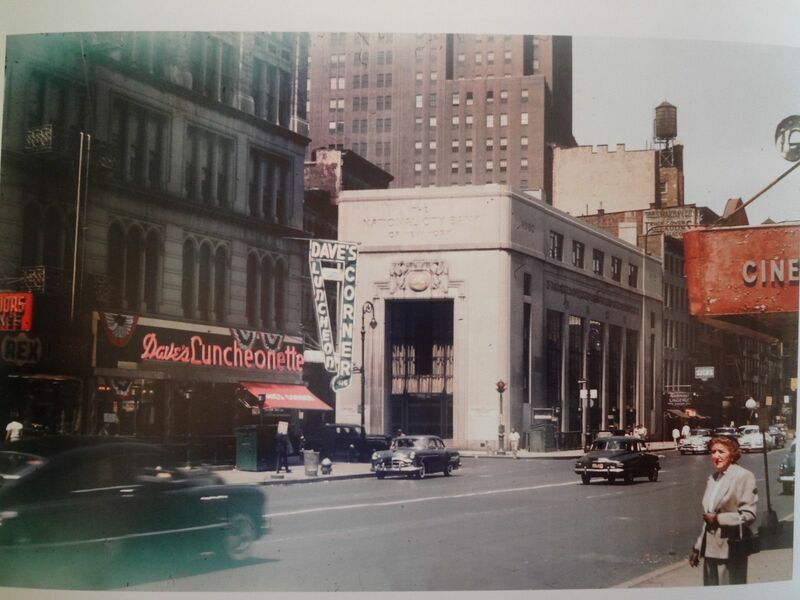 A view of the same corner from the northeast, apparently in the 1950s. The National City Bank building in the center of the photo is still there. There were only so many after-hours places in Manhattan. Coffee Shop on Union Square (that's the name, it was a trendy restaurant/bar and not actually a coffee shop) and Florent in the Meatpacking District were my personal favorites, but there were many scattered across the landscape. If you spent enough time in Manhattan, you eventually found out where they were and went back. And back. And back again. Because a good late-night place was one of the true delights of living in the city. The view from the northast, as in the preceding photo (Google Street View). Anyway, times change, but the more things change, the more they stay the same. People still have to eat, so there's another restaurant on that corner and a food truck out front. Back in the day, Dave's took care of all that by itself. Canal Street at Broadway, Manhattan, ca. 2018 (Google Street View).